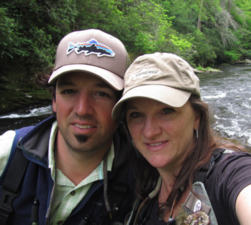 Ian and Charity Rutter of R&R Fly Fishing in Townsend, Tenn. headline the 29th annual Rabun Rendezvous, taking place Jan. 23, starting at 5 p.m., at the “New” Dillard House Conference Center, located behind The Dillard House. The annual fundraising event, brought to the community by Rabun TU, is designed to raise awareness about protecting our cold water resources. All are invited, including trout fishing enthusiasts and their families, friends, and all who love clean, cold streams, trout, and trout fishing. The Rutters offer premier guide services specializing in the Great Smoky Mountains and East Tennessee and have published five books on “Fishing the Smokies.” They are great presenters, the Rabun TU website says, as they highlight their programs with beautiful photography and video. The night begins with the traditional rocking chairs on the porch of the Conference Center as folks gather to "pick the pig." There will be snack trays of cheeses, crackers, veggies with dips, and fruits. Soft drinks and ice will be available. This is also a BYOB event. 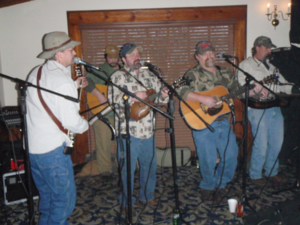 The Foxfire Boys will be on hand to entertain with bluegrass music. Dinner options include fish, chicken, and pork ,with all the side dishes and desserts that have made the Dillard House so famous. Dinner is served at about 6:30 in buffet form. Cost to attend and indulge is $33 for adults, $25 for those under age 15. Cash, checks, VISA, or MasterCard are all accepted. All payments are to be made at the door. The Dillard House has set special rates for rooms starting at $69 (plus tax) for those who call referencing the Trout Unlimited Rabun Rendezvous. Call 706-746-5348 or toll free at 1-800-541-0671. In addition, Mountaine Aire Cottages & Inn on North Main Street in Clayton is giving special rates for attendees. Call them at 706-782-9568. "The Rendezvous was unlike anything before or since, a gathering of uninhibited men down from the mountains. The event attracted perhaps a hundred mountain men, their Indian wives, and assorted visiting tribesmen. Amusements included gambling, drinking, storytelling – continuing day and night,” author George Laycock says in The Mountain Men, as referenced on the rendezvous website. Photos courtesy of Rabun TU. Jan. 21 - The Rabun TU regular monthly meeting takes place with a social at 6:30 p.m., followed by the meeting at 7 at the Rabun Gap Presbyterian Church. The January guest is Rabunite Landon Williams. His topic is "Innovative Nymphing Techniques for Wintertime Dredging." Williams is known for his yearround fishing talents. Feb. 6 - (tentative date) Annual planning meeting to be held at the Dillard House. Everyone is welcome. Breakfast is served at 8 a.m.
Feb. 18 - Regular monthly meeting (same details as above, speaker to be announced). Feb. 25 - Board of Directors meeting takes place at 6:30 p.m. at the church. Social kicks things off, followed by the meeting at 7. Agenda will include a recap of the rendezvous and upcoming events.